licensed by the Consular Section of the Ministry of Foreign Affairs of the Republic of Bulgaria in 1991. 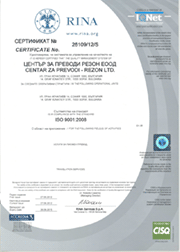 REZON TRANSLATION CENTER EOOD is one of the first licensed translation agencies in Bulgaria. 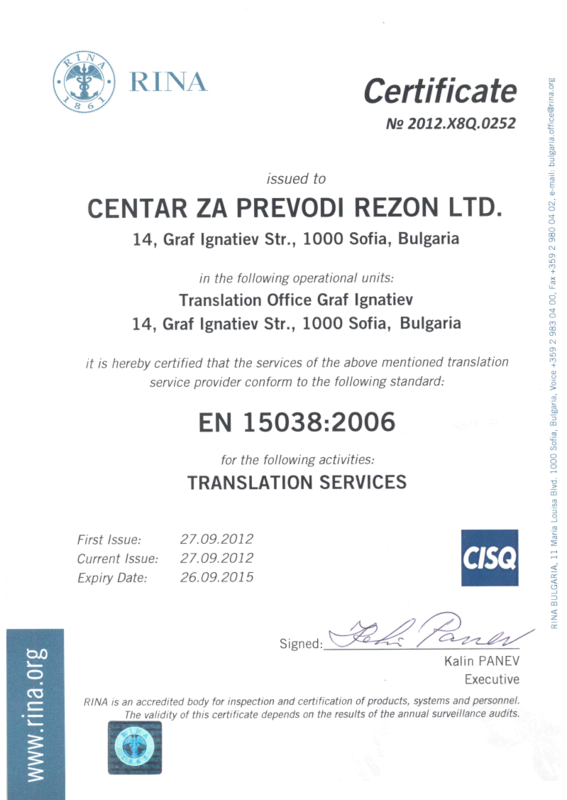 At REZON TRANSLATION CENTER EOOD we have been making high-quality specialized translations in 47 languages and have been legalizing documents issued by virtually all Bulgarian institutions ever since 1991. We work with experienced translators who have made a name for themselves in the industry, but over the years we have helped develop many professional translators as well. Currently we work on regular basis with over 3300 translators with vast experience and wide range of expertise in various different fields. All of our translators have signed declarations concerning the veracity of their translations as well as confidentiality agreements that guarantee the non-disclosure of any information contained in their translations. We have a young and dynamic team of individuals driven to succeed and develop professionally who display great levels of flexibility in order to achieve our common goal. They take you order and coordinate the activities of all parties involved in the production cycle: customers – translators – editors – page designers – couriers – customers. They track the progress of every translation job from the moment of taking the customer’s order to the moment of delivering the end product to make sure everything is done correctly. You can count on us to deliver high quality product and correct and fast service no matter the size of the translation job. 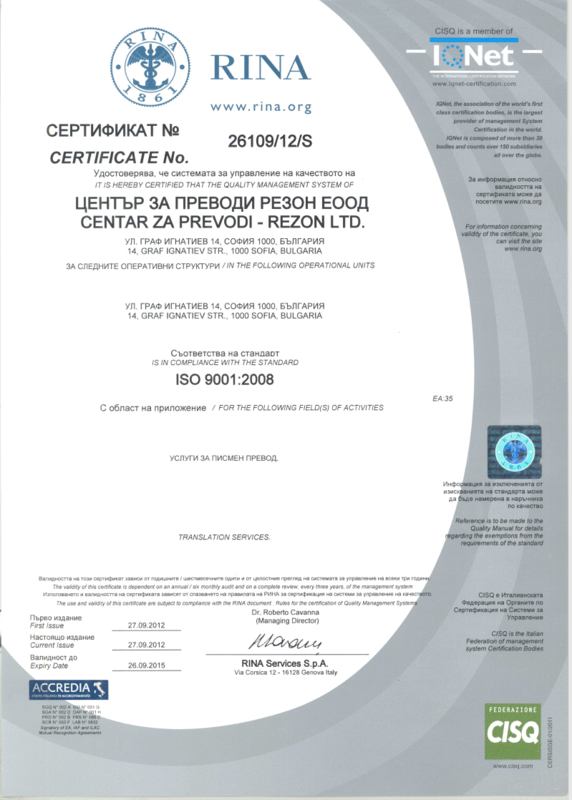 REZON TRANSLATION CENTER EOOD provides expert advice on page design, translation, and legalization of any official document making sure it will be recognized by any foreign government. Quality, expertise and discreteness are the three key values we have never compromised with in the 23 years we have been in business. REZON Translation and Legalization Center was licensed by the Consular Section of the Ministry of Foreign Affairs of the Republic of Bulgaria in 1991.